We stock a full range of machines for every application both new and second hand. A years warranty is available on heavy duty machines. We can custom build to your own specification if required. Hot pressure washers or steam cleaners by Ehrle, Karcher, Nilfisk-Alto, Cleanwell, Kranzle, and Lavor. 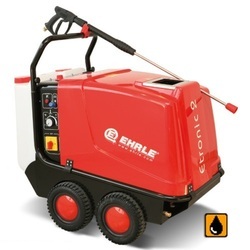 Cold water pressure washers by Ehrle, Karcher, Nilfisk-Alto, Cleanwell and Kranzle. There is a large range of floor care scrubber driers, sweepers and vacuum cleaners, floor polishers, brush machines available. A great British company Numatic International is well represented here for Numatic scrubber driers along with other reliable manufacturers such as Karcher scrubber driers, Nilfisk Alto scrubber driers and Lavor scrubber driers. Petrol or diesel pressure washers are robust and flexible in their usage area. Vacuum cleaners providing solutions for the home, hotel, office, and many industrial applications are available in Nilfisk Alto vacuum cleaners and Ehrle vacuum cleaners. Any queries please contact ACE Cleaning Equipment.